A three part stacking ring that when worn together forms a Claddagh ring. Sterling silver bands with a 10k gold heart. Handcrafted by experienced Irish artisans and presented in a luxury ring box. The Celtic shield design is inspired by the designs found on the famous Ardagh Chalice. We have used this same Celtic knotwork to decorate the Sterling silver band. 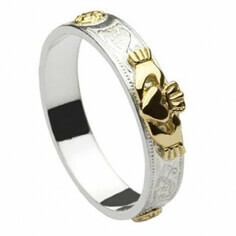 14k gold Claddagh designs and shield designs are placed evenly around the ring. A Celtic weave design covers the back of the Sterling silver band and a 10k gold heart is the centerpiece for this extraordinary women's Claddagh ring. Handcrafted in Dublin, Ireland before being tested and hallmarked by the Dublin Assay Office. A thick 8mm wide Sterling silver band with the Claddagh emblem engraved into it. 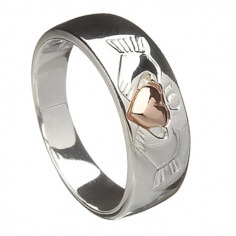 The heart of the Claddagh design is rose gold plated to make it stand out more. 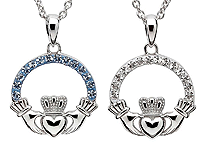 Learn more about the meaning of the Claddagh below. 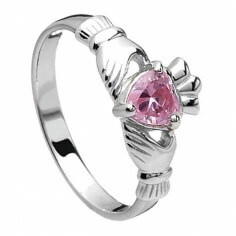 Treat your adorable baby girl to her first real jewelry with this beautiful Claddagh ring baby. The two hands represent friendship, the crown is for loyalty, and the heart symbolizes your eternal love for one another. Available in 10k gold. 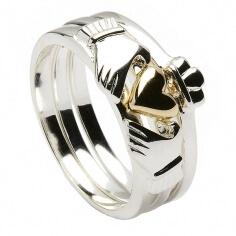 The unisex Claddagh ring is crafted from the finest Sterling silver and has a 10 carat gold Claddagh design set into the front of the band. This very popular ring is suitable for both men and women, making it the perfect matching couple ring set. 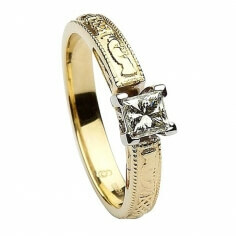 A considerably wide band at 8mm, the women's antique finish Claddagh band is a joy to behold. 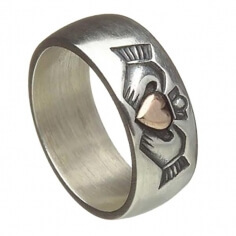 The antique finish in particular sets off the central rose gold Claddagh design. A very modern twist on a traditional design. Sterling silver womens Claddagh design ring with Connemara Marble set into the heart of the Claddagh. 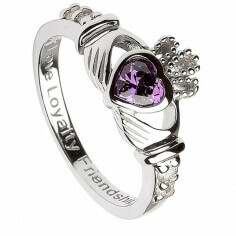 The Claddagh represents love, loyalty and friendship. The yellow marble is vibrant against the Sterling silver band. 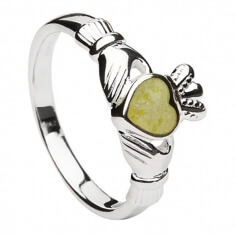 Beautiful Connemara marble fills this Claddagh heart. The brown marble sits perfectly against the 10 carat gold Claddagh ring. A meaningful, symbolic ring that actually has a little piece of Ireland included in its design. This delicate little ring packs a punch. 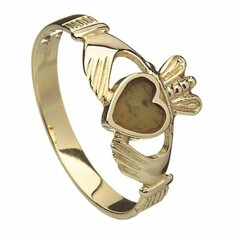 Crafted from Sterling silver, the Claddagh design is highlighted with a gold plated heart. 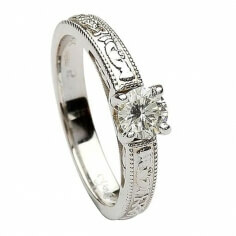 The band has intricate Celtic knot designs engraved into the band. 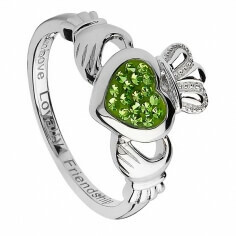 An elegantly styled Sterling silver Claddagh design heart ring with green cubic zirconia. 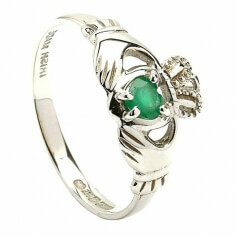 The emerald green stone is set apart against the white of the Sterling silver setting. 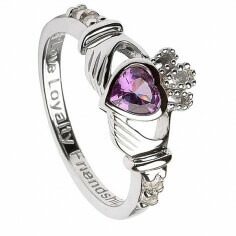 This beautifully designed Claddagh ring represents love, loyalty and friendship. 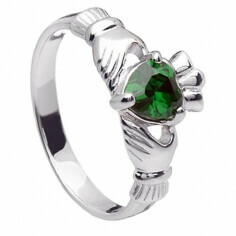 Celebrate Saint Patrick's Day in style with this Swarovski green crystal Claddagh ring. The heart, crown and hands represent love, loyalty and friendship. Handcrafted in Ireland by trained leprechauns and dipped in snake repellent for additional potency! 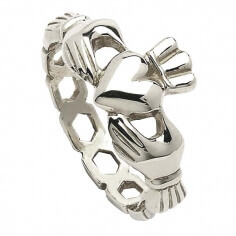 This men's silver classic Claddagh ring is a design 300 years in the making. The design itself represents love, loyalty and friendship - rarely is it we see a Sterling Silver ring with such meaning and beauty. 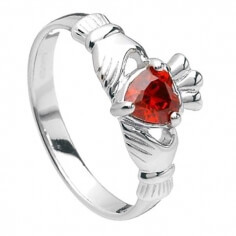 The women's silver classic Claddagh ring is a very popular choice. 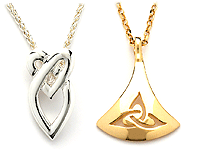 Solid in design with beautiful curves and a Sterling silver polished finish. 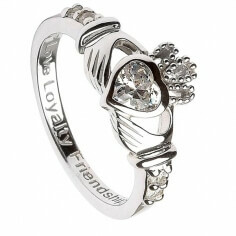 The Claddagh of course represent the three most important values in any relationship, love, loyalty and friendship. 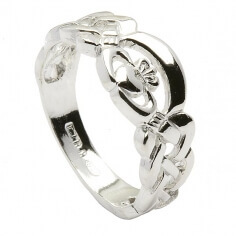 Celtic knot designs come from both sides of this ring and meet in the middle to form the famous Claddagh design. 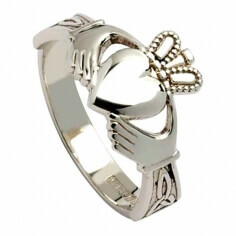 A solid Sterling silver Claddagh ring that is handcrafted in Ireland by skilled Irish artisans. 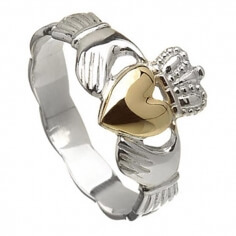 The medium silver Claddagh ring is the perfect Claddagh ring. Authentic in style and design, this ring is handcrafted in Ireland by experienced Irish artisans. Celebrate love, loyalty and friendship with the ultimate promise ring. 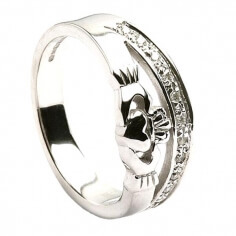 This is the men's heavy silver Claddagh ring. A solid ring that sits well on a mans larger hand. Beautiful curves line this Sterling silver ring that is handmade to order by skilled Irish artisans and hallmarked by the Dublin Assay Office. 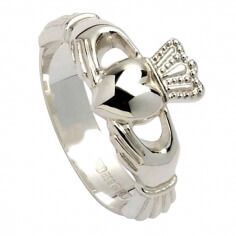 The womens silver Claddagh ring with high crown is a new take on a classic design. 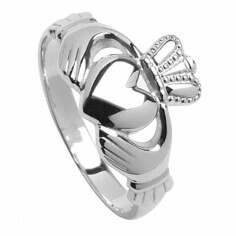 The crown on top of the Claddagh runs high, giving the ring more depth. A beautiful Irish promise ring that represents love, loyalty and friendship. 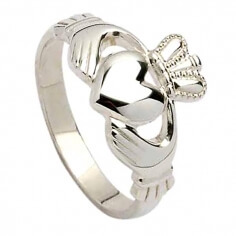 The women's silver Claddagh ring with Trinity cuffs combines the romanticism of the Claddagh symbol with the deep meaning of the Trinity knot. A Trinity knot forms each side of this ring, leading into the Claddagh center. The men's silver Claddagh ring with Trinity knots effortlessly combines the symbolism of the Claddagh with the ancient design of the Trinity knot. 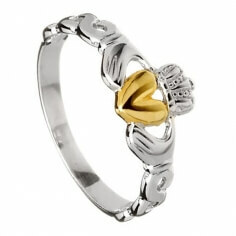 The central Claddagh design consists of a heart, two hands and a crown which represent love, loyalty and friendship. 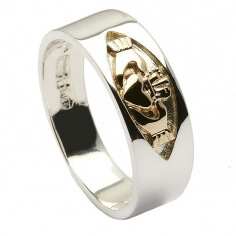 A curved heart, heavy cuffs and a Sterling silver chain band all combine to create one of the more unique Claddagh rings for men. Show the world just what love, loyalty and friendship means to you. 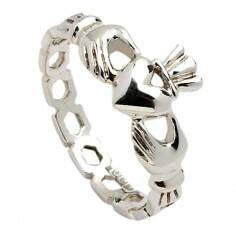 The women's silver chain Claddagh ring is a unique style that is sure to catch the eye. 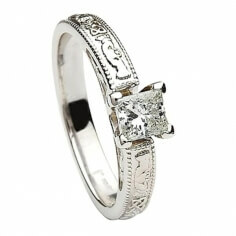 The Sterling silver band has a chain link effect and leads to the famous curved Claddagh design in the center. 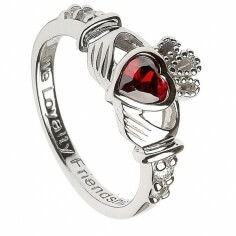 Beautiful women's Claddagh birthstone ring, with the words "Love", "Loyalty" and "Friendship" engraved on the inside of the band. The January birthstone is garnet, believed to offer protection from nightmares. 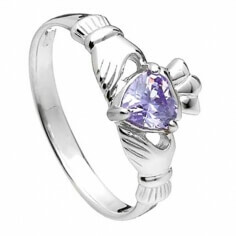 This exquisitely designed Claddagh birthstone ring has a beautiful amethyst cz stone as the center heart. Amethyst represents the month of February and signifies peace and calm. 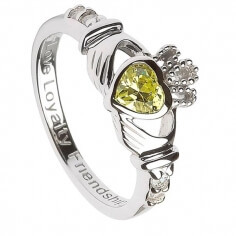 Love, loyalty and friendship, the three values represented in the Claddagh ring. Our beautiful March birthstone Claddagh ring puts more emphasis on these values by engraving the words on the inside of the band. Diamonds are the birthstone for April, but we use sparkling cubic zirconia in our women's Claddagh birthstone ring so as to keep it affordable. The words Love, Loyalty and Friendship are engraved on the inside of the band. 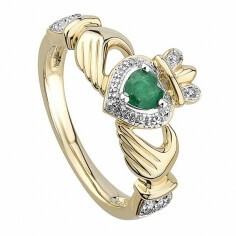 Our May Claddagh birthstone ring is beautifully crafted with a deep emerald green CZ stone as the heart centerpiece. 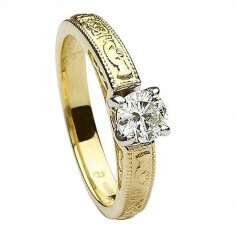 The important words the ring represents are carefully engraved on the inside of the band; Love, Loyalty and Friendship. Alexandrite represents the month of June and is also believed to offer good luck. 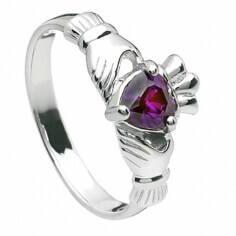 We use a beautiful alexandrite CZ stone as the heart for our women's Claddagh birthstone ring. 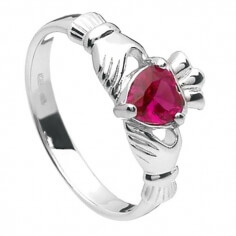 Our light ruby, heart shaped CZ stone is the centerpiece of our sterling silver July birthstone Claddagh ring. On the inside of the band you will find the words Love, Loyalty and Friendship engraved. Made from Sterling silver, the center stone is a Peridot CZ. The Peridot represents the month of August but also loyalty, dignity, and reputation. A perfect gift for the lady in your life. 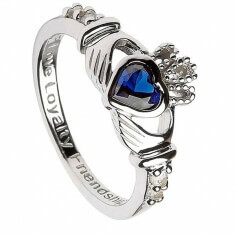 The women's September birthstone Claddagh ring, represents the month with a beautiful Sapphire CZ stone as the heart in the center of the ring. On the inside of the band you can read the words; Love, Loyalty and Friendship. The month of October is well presented by the beautiful pink CZ stone. The pink diamond is also thought to represent beauty and charm. 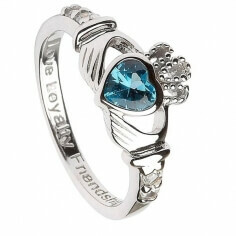 The November birthstone Claddagh ring is highlighted by the Topaz cz heart-shaped stone. This beautifully crafted Sterling silver ring also has the words; Love, Loyalty and Friendship engraved on the inside of the band. 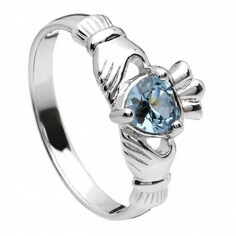 The December birthstone Claddagh ring has a beautiful heart-shaped blue topaz CZ stone and the Sterling silver band has the words; Love, Loyalty and Friendship etched on the inside of the band. The January birthstone in this ring is a garnet, and it symbolizes consistency, creativity, patience, and endurance. The wearer of the stone is believed to be protected during travel. The February Claddagh birthstone ring is a very meaningful ring to wear as the Claddagh ring generally symbolizes friendship (hands), love (heart), and loyalty (crown). How the ring is worn also says a lot about the person wearing it. 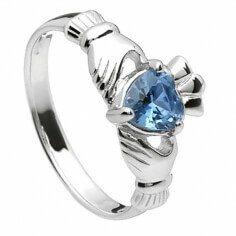 Aquamarine is the birthstone on this ring. This stone symbolizes creativity, health, perception, courage, and hope. The wearer is believed to be protected from liver, stomach, and heart diseases. 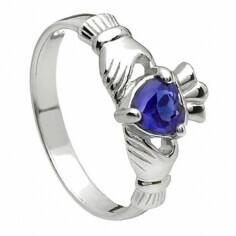 This Claddagh birthstone ring is a perfect gift for anyone with their birthday in April. 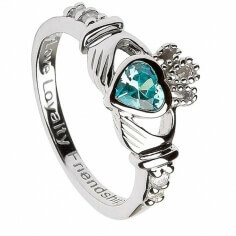 The Claddagh ring symbolizes friendship, love, and loyalty between two people. 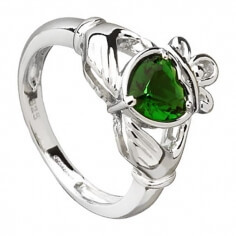 This ring also has more meaning because the May birthstone is an emerald. Emeralds have long been associated with fertility, birth, and love. It is also a symbol of wisdom, patience, and growth. 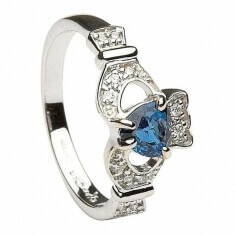 The birthstone in this ring is also symbolic. June's birthstone is an alexandrite, and it symbolizes joy, luck, courage, and love. The wearer is said to be able to align their mental and emotional functioning. 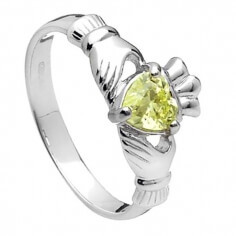 The July Claddagh birthstone ring symbolizes over 300 years of Irish culture. 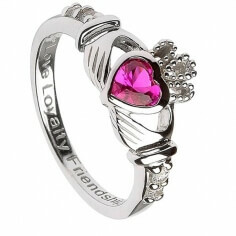 This ring with its two hands cupping a heart and wearing a crown symbolizes friendship, love, and loyalty. 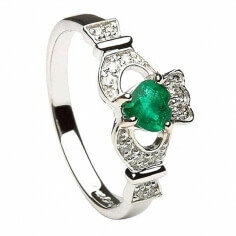 Irish culture says that this ring is to be worn to symbolize whether the wearer has given their heart to someone or if they are looking to give their heart to someone. It was considered to be a token of friendship, love, and marriage. 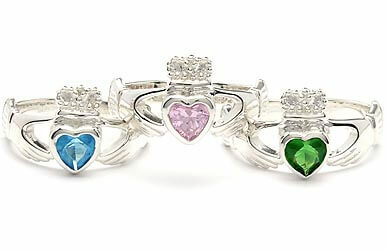 The September Claddagh birthstone ring makes a great gift to someone as a way of showing love, friendship, and loyalty. The ring traditionally is given as a token of friendship, love, and marriage, but it can be given as an expression of love in any means. 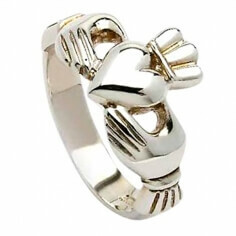 A Claddagh ring is a very specific tradition in Irish culture that has spread across the world. 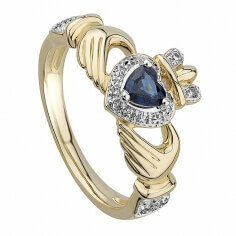 The ring was traditionally given to a loved one as a token of friendship, love, and marriage. October's birthstone is a pink tourmaline. 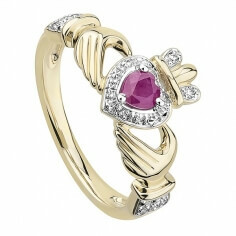 A Claddagh birthstone ring is very symbolic in many ways. 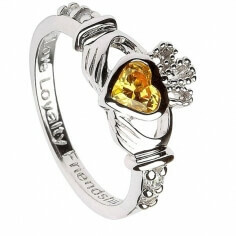 November's birthstone is a citrine. This stone symbolizes energy, optimism, and warmth. It is believed to allow the wearer release tension and increase their flexibility. This Claddagh birthstone ring is a great gift for anyone born in December who also appreciates Irish culture. The history of the Claddagh ring dates back over 300 years, and it was originally given as a token of love, friendship, and marriage. This beautiful hand-crafted Claddagh engagement ring is available in 10k, 14k, or 18k yellow or white gold and has a single diamond in the center of the heart, surrounded by accent diamonds, giving a total weight of 0.35 carats. 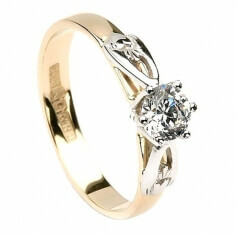 The Claddagh engagement ring is available in 14k yellow gold with white gold setting to perfectly enhance the diamond. Alternatively you can choose to have the entire ring made from 14k white gold. 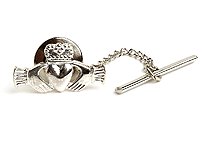 The shoulders of the band are carefully crafted Claddagh designs symbolizing love, loyalty and friendship. The classic round diamond cut. 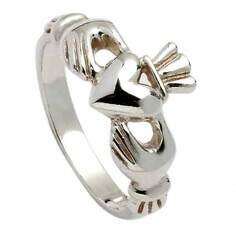 The traditional Irish Claddagh symbol. 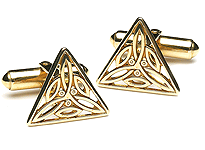 The ancient Celtic knot design. 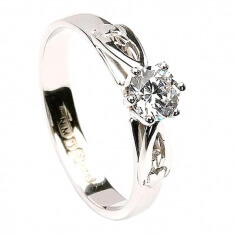 All given a brilliant modern twist in our exceptional 14k white gold Round Cut Claddagh engagement ring. A love for the ages deserves special commemoration. Honor the timelessness and deep emotion of your relationship with centuries-old symbols of love and devotion found in our embossed Claddagh engagement ring. Handcrafted by Irish artisans and presented in a luxury ring box. The whispers of the past meet the modern day in our 14k white gold Princess Cut Claddagh engagement ring. The solitaire setting features four prongs and a light-refracting open gallery to secure and showcase your princess cut diamond. Your love is extraordinary, so it stands to reason your engagement ring should be extraordinary too. Highlight the geometric beauty of your princess-cut diamond with our embossed Claddagh engagement ring. 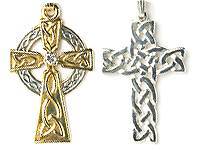 Handcrafted in Ireland and hallmarked by the Dublin Assays Office. This exquisite green emerald and diamond Claddagh engagement ring is handcrafted in Ireland and then sent to the Dublin Assays Office to get tested and hallmarked. This is your mark of authenticity and quality. This stunning blue sapphire and diamond Claddagh engagement ring is handcrafted in Ireland and then sent to the Dublin Assays Office to get tested and hallmarked. This is your mark of authenticity and quality. This beautiful ruby and diamond Claddagh engagement ring is handcrafted in Ireland and then sent to the Dublin Assays Office to get tested and hallmarked. This is your mark of authenticity and quality. At first glance, this ring looks like a contemporary design, but closer inspection shows the traditional ancient Claddagh design which has been given a new and unique modern style by our skilled craftsmen. 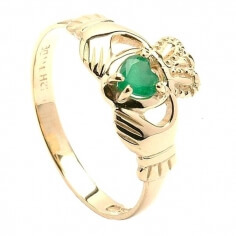 This traditional Claddagh ring has two variations in style, the first being the cool white 14k gold which it is crafted from and the second, the vivid green heart shaped emerald which forms the center piece of the ring. This is a gorgeous version of the traditional 300 year old Claddagh design, this time our craftsmen have featured a vivid green heart shaped emerald as the center piece of the ring. It bears the hallmark of the Dublin Assay Office, your guarantee of quality. 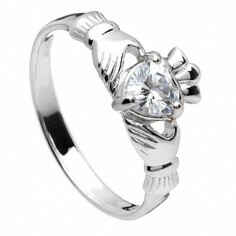 This stunning 14k white gold Claddagh ring is unmistakably Irish. 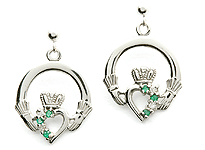 The hands and crown of the Claddagh are enhanced with twelve fine quality diamonds and the heart is formed from a vivid green emerald which is 0.45 carat. This stunning gem set Claddagh ring features twelve sparkling diamonds surrounding an unusual heart shaped sapphire center stone of 0.45 carats. The ring is handcrafted from 14k white gold and would be the perfect choice for an engagement ring. 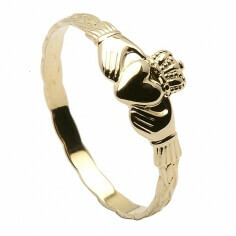 The Claddagh has been used as a wedding band for centuries. 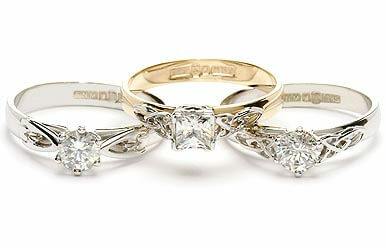 We have incorporated the traditional design into modern wedding bands. Hallmarked by the Dublin Assay Office. 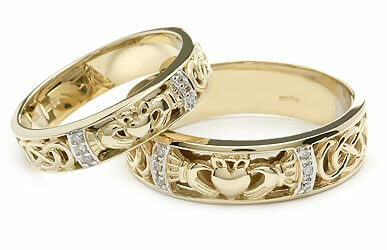 We are sure you will find the perfect one in our large selection of Claddagh wedding rings. Choosing the right Claddagh engagement ring is made easy with this wonderful collection of engagement rings to browse through. All diamonds are certified by the G.I.A (Gemological Institute of America). Each ring comes with luxury packaging and free shipping. The perfect way to celebrate a special birthday for a lover or friend, our Claddagh birthstone rings represent love, loyalty and friendship. Each birthstone represents a month and several characteristics. Treat your best friend with the ultimate friendship ring. The globally famous ring is associated with Claddagh, an Irish fishing village which is just outside the Galway’s old city walls. However, you have probably come across a range of weird and wonderful spellings when searching for the legendary ring online. We’ve seen numerous common misspellings which are easy enough to understand including Cladah, Claddah, Cladagh, Cladaugh, Clauddagh and Claddaugh which is arguably the most frequent mistake. These misspellings are actually understandable as they are only a letter or two away from being correct and sound a bit like Claddagh when said phonetically. However, we’ve also seen some truly bizarre attempts such as Cladder, Claudia, Clauda and even Clatter (we’ve no idea how the last one in particular managed to slip through the net!). 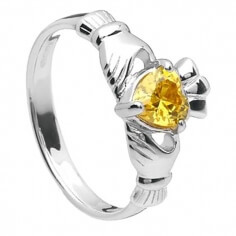 Irrespective of how you might spell it, the Claddagh Ring is representative of love, loyalty and friendship so bear this in mind when searching for one online, even if you end up looking for a Clatter Ring!